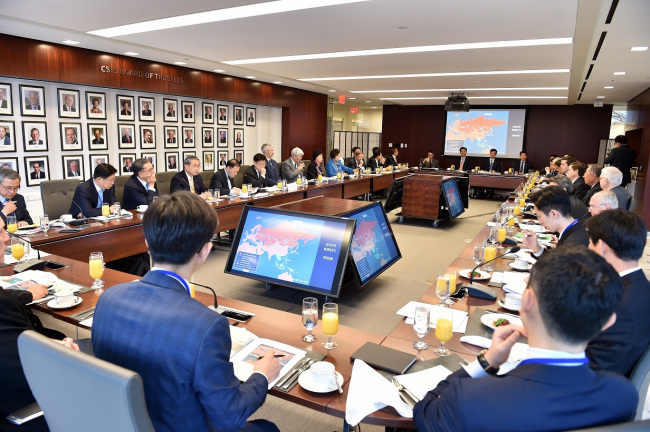 A business delegation led by the chief of the Korea International Trade Association met with the deputy US trade representative in Washington on Monday to convey the concerns of Korean steel exporters amid growing uncertainty over the export landscape in the US. The delegation included representatives of Samsung Electronics, Hyundai Motors, Posco, Mando, Hyundai Steel, Hanwha Q Cells and SK Gas. “An amicable settlement in the trade deal between Korea and the US allows companies from both nations to make stable and long-term trade and investment strategies,” said Kim Young-ju, CEO of KITA, at the meeting with Jeffrey Gerrish, deputy United States trade representative for Asia, Europe, the Middle East and industrial competitiveness. “However, there are still concerns among Korean companies after President Donald Trump’s remark to delay finalizing the deal. We hope the revision of the trade deal is sealed as early as possible,” Kim added. Late last month, US President Donald Trump threatened to delay finalizing the renegotiated trade deal by linking it with North Korea’s denuclearization talks. A few days before his remarks, the two nations announced they had reached an agreement on the revision of the deal, including an exemption of tariffs on Korean steel, ending three months of talks. Kim said it is fortunate for Korea to be excluded from the Section 232 tariffs on steel, but concerns remain as the quota standard is not confirmed because the US is still in talks with other countries also excluded from the tariffs. In March, Trump temporarily exempted Canada and Mexico, saying a final decision would be made based on negotiations over the North American Free Trade Agreement. “In order not to harm the US companies demanding imported steel, a rational standard should be made,” Kim told Gerrish. During the visit to the US, the business delegation also met with John Hamre, CEO of the Center for Strategic and International Studies, and Kim Holmes, leader of the Heritage Foundation. At the meeting, Kim said the trade deal with Korea and the US is a favorable agreement as it improves trade, investment and employment in both nations, adding 437,000 jobs were newly created within the US with respect to trade with Korea. He also said investments of the two nations had more than doubled during the period 2012 to 2017, reaching $53.6 billion, compared to the previous five years before the deal took effect. The delegation also attended a trade meeting hosted by the American Enterprise Institute. Kim suggested future cooperation between KITA and the think tank in trade research areas.